You wake up every morning, you go to work, you pray for the end of the day, you yearn for the end of the week. You don’t like the work you do, you feel unchallenged, you feel unwanted, you hate your boss; you sit around with your coworkers and complain about everything wrong with the company, thinking this can’t be all there is. You daydream about what you really want to be doing. You have so many ideas, desires, aspirations, and goals, but you put them aside for another day. You do this day in and day out, feeling unfulfilled, and stuck. Does this sound like you? My dear, you are not alone. Many of us live in this repetition, going around in circles, feeling like we are living in our own personal Groundhog Day. I was just like this before I decided that I wanted a career that made me feel fulfilled. We are creatures of comforts and habits, so even though we are miserable doing what we are doing, we keep doing it because it is what we know and what we are used to. It is like an old sweater that should have been thrown out years ago. It is so comfortable that you can’t bring yourself around to throwing it away. You ask yourself, “what if I can’t find another one just as comfortable?” “What if I buy a new one and it doesn’t quite fit?” Like the old sweater, your job has provided you with comfort. This comfort is a steady pay cheque, security, and the fact that you know the job inside and out. It is your security blanket protecting you from all the fears of failing, or feeling like you are not good enough. You think about leaving, once, twice, sometimes three times a day, but you worry that you won’t fit in anywhere else. You think to yourself, “I don’t know how to do anything else.” But you do! Think about when you first started your current job. You were new, you didn’t really know what you were doing and you had to learn all the processes, procedures, and protocols. You’ve been there before. You have started something new and I know that you have it in you to begin again, but this time, following your truest passions. My clients ask me this all the time. I don’t have the perfect 5-step plan, or the #1 secret to getting everything you want. What I do have is personal experience. I was right where you are now. Feeling unfulfilled at work, counting the hours until the end of the day, and counting the days leading up to Friday. The problem was never my boss, or the company I was working for. The problem was myself, getting in my own way of what I truly wanted and what was calling out to my soul. It wasn’t until I made the terrifying leap into the unknown that I started down the career path I was always meant to be on. This is what I want for you. I want you to feel the happiness that I feel doing something that you love. In the beginning, my intention was only to change my career. However, during the process of working towards that, my entire life started to transform. Without even realizing it, all other areas started to shift in such a positive way. I was choosing a healthier lifestyle, I was a better wife to my husband, I had more patience, I was making more time to have fun and do things that I loved, and I started an amazing spiritual practice that kept me on course even when things went wrong. That is what happens when you start to feel fulfilled. Life starts to flow with ease. I want all of this for you, so if you are ready to start a new career, here are a few steps that helped me finally break free and not only find, but live my life purpose. The most important thing for me was figuring out what my intentions were. Before making any change, it is important to get clear about what you really want. Is it to apply for the same position, but with a different company? Do you want to start your own business? Do you want to go back to school? Or, do you want to change career paths altogether? Whatever your intentions are, get clear about them and write them down. This will help you stay on course while taking the steps to achieving your goals. Most importantly, the end result of any intention is to be happy and feel fulfilled at whatever you are doing. Changing careers, but still feeling miserable, will only bring you full circle to where you began. So #1 on your list should be, HAPPINESS! If you don’t know what you want, only that it is not your current job, hire a career coach. That was the first step that I took when I made the decision to make a change. I will forever be grateful for the guidance and clarity from Coach Mary. 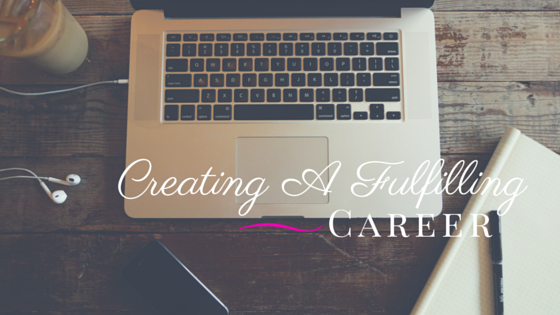 Connecting with a career coach can be a priceless investment on your path to career fulfillment. I also highly recommend having your Myer’s Briggs Career Personality Assessment done. It is an amazing tool for gaining clarity and knowledge about what you are naturally being drawn to. My dear friend Jolene Watson of Clarity Coaching & Development is my go-to guru referral. Within minutes of meeting someone, she is able to asses their individual personality type. She can point you towards a career that you are most naturally drawn to, that matches your own individual personality. If change is difficult for you, which it is for so many of us because we tend to like things as they are, even if it is no longer working, I recommend this video. 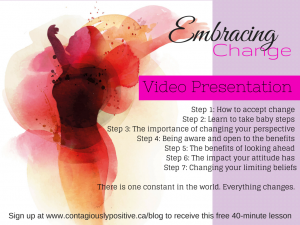 It is a 4o-minute guide presentation that I created on how to create and embrace lasting change. Click the image below to be guided to the video. Before I became a coach, I spoke to other coaches and asked them what steps they took to get certified and the ups and downs of starting a new business. Once you know what it is that you want to do, connect with other people who are already doing it and ask them for any helpful advice. Most people are happy to share their stories and help you along the way. The knowledge I learned from reaching out, and asking questions, has truly been priceless and beats anything I would have ever learned in a book or on google. When I decided to become a coach, I had an endless list of steps of what I needed to complete before I even started my own coaching practice. I started with step one and slowly worked my way down the list. I didn’t try to do everything at once. I took baby steps until I felt ready and confidant to move forward. Figure out what you need to do to make the career change. Does it require going back to school? Does your resume need an update? Do you need to hire a coach? Do you have to set aside some money first? Do you need a certification? Start writing down the steps that are required to get you from where you are, to where you want to be. Once you have completed your list, start crossing off each item. Important to Remember: baby steps can sometimes turn into procrastination, so be aware if you haven’t moved forward in awhile. If you feel stuck, ask yourself what is preventing you from moving forward onto the next step. We often realize that we are just fearful of moving forward. This quote is one of my favourite motivators and I keep it on my vision board. If a fulfilling career is on your list of things to do, don’t wait, start today, and take the first step by getting clear about what you want. Get yourself ready to hit the ground running because a fulfilling career is around the corner, waiting for you to show up.